Start On Your Road Today To Losing Weight, Attaining Better Health and Running Your First Race!Even a Little Bit Of Running Can Mean A Whole Lot Of Lifestyle Change!In the United States it is estimated that greater than 60% of the population is overweight. Greater than 30% are considered obese and likely to face grave health issues as a result. Where do you think that the population of avid runners falls in that statistic? Without reading any further, would you guess that runners are in the 30% of the “safe” side of that statistic, or the side more likely to face potentially deadly health issues?Beginner's Guide to Running!This book is written for someone who wants to start running to change their life, whether that means to lose weight, relieve stress or gain confidence and maybe run their first 5k. 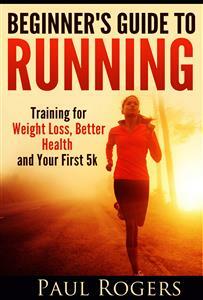 Some of the things that you will learn in this book include:- Getting the right pair of shoes- Treadmill or Road?- Choosing the right running surface- Using Proper Running Form- Steps to Avoid Injury- Preparing for your first raceWritten by a Passionate Runner for Passionate Beginners!I wrote this book because I wanted to share what I love about one of my greatest passions. I want to get people as excited about running as I was when I started and I am today. I hope by reading the book I can encourage you to start something that can be a lifestyle change (and hopefully not make the mistakes I made along the way!). I would like nothing more than to hear back from people that they are now “Hooked”. Let's Get Running!